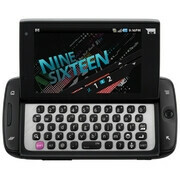 The original T-Mobile Sidekick was loved by its fans as it was built for instant messaging from the ground up. Unfortunately, its appeal dropped significantly after the carrier had to pull the plug on the Danger cloud-based social networking services. However, rumors about T-Mobile reviving its acclaimed smartphone as the T-Mobile Sidekick 4G started circulating the web several months ago until they were eventually confirmed to be true by the carrier itself. So when are we going to see the Sidekick 4G you may ask. Well, thanks to a recent tweet by RadioShack, we now know that T-Mobile's smartphone is going to hit the shelves on April 20, which is when the T-Mobile G2X and the T-Mobile G-Slate are rumored to be scheduled for release as well. Priced at $99 after a mail-in rebate and a two year unlimited data contract, the T-Mobile Sidekick 4G will be powered by a snappy 1GHz Hummingbird processor and will feature a spacious 4.5-inch WVGA touchscreen display. Android 2.2 Froyo will be running the show while a 21Mbps HSPA+ radio will be responsible for keeping you connected to the web. You mean 3.5 inch, not 4.5?